The Son of Neptune by Rick Riordan. A Heroes of Olympus Book. Review: Do you ever wonder what it is like to be a child of a god? In The Son of Neptune written by Rick Riordan, Percy Jackson has lost his memory. Percy has to fight monsters, go to a camp of warriors, and survive getting attacked by giants. And if you think that is hard, try making some friends along the way. Percy meets a few new people to the Heroes of Olympus series. Those people begin with Frank, Hazel, Octavian, Reyna, Terminus, and last but not least, the giants. But when Thanatos is captured by Gaea, and her son Alcaeus, It is up to Percy and friends to save the day. And what is worse than having a time limit. With the Feast of Fortuna coming up and an attack by a giant's army, will they escape this adventure with their lives? The Romans and Greeks have never been friends. In The Lost Hero,the first book in the series, Jason is barely kept alive a result of conflict. In The Son of Neptune Percy could have been killed if hadn't been for Juno. They are also very similar. Jason is a son of a forbidden god and so is Percy. They meet up with the rivals to their gods and have to face-off with them. Percy and Jason have unique fighting strategies. Jason forces a god to teleport, but can Percy kill one? And how will the other similarities affect Percy's quest? Will those similarities save Percy and his friends? The Son of Neptune is a tremendous book. It fills you with all sorts of emotions and surprises you every time you turn the page. This book can be viewed as many genres and is a book for all ages. If your friend says they can't read it because it is so long, then tell them that its length is what makes it so an excellent read. It tells of a great story and its many details keep you up to pace. This book is a must read and will also teach you Roman words. 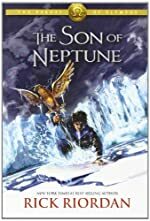 The Son of Neptune is one book that is perfect for a long trip when you can get brought up to date in Rick Riordan's novels. This book was one of the greatest I have ever read. In fact I cannot wait for Rick Riordan's next book. The Son of Neptune sets high standards for authors worldwide. Individual parts of the book shined the most. I would even say Athena's wisdom would be rivaled by Rick Riordan. The quote that I thought was important to the book was when Juno says, "So what will it be? Safety, or a future of pain and possibility?" That meant a lot to me because if he crossed over he could die and if he didn't, he would get chased by gorgons until they find his weak spot and kill him. So he has to make the choice that is better for everybody else. It also shows that he is as selfless as a true warrior that wants to win a battle even if it means he would sacrifice himself. "All hail Rick Riordan" will fill everybody's mind once they read The Son of Neptune. We would like to thank Joseph for providing a copy of The Son of Neptune for this review. Have you read The Son of Neptune? How would you rate it?